I’m going to switch up my style a little on this review and start out with my recommendation. I usually save that for the end, but it is more fitting here, in my opinion. I would recommend this book for those who are interested in learning more about Turkish and Islamic culture through literature. I believe strongly that one can learn a lot about a culture and a people by reading their literature and observing their arts. This is no exception. The story takes place partly in Turkey and partly in London, but you cannot read the book without being fundamentally introduced to Turkish culture and thinking. Obviously, I do not encourage you to read this book so that you can create stereotypes and have one opinion of Turkey, because that would be ridiculous! But, you will definitely be introduced to ideas and thought processes that are present in the Turkish and Islamic mindset. However, I would not recommend this book for a young audience. There is some objectionable material in the book between illicit relationships and language, so you need to be aware of that before picking up the book. However, that being said, this is one of those books in which the objectionable material is very true to life and is included in the book for the purpose of strengthening the story line. Okay, so on to the story . . . this is an extremely sad story, and I have only just finished it moments ago and am still trying to process it myself. The story is told in an asynchronous fashion, and at times I found it difficult to figure out what pieces were important and where they were reconnecting with the larger story line. I think that Shafak was aiming for a cyclical feel to the story as pieces of the characters’ lives kept coming back into play or repeating themselves. 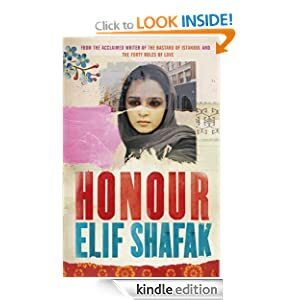 I do think that the story is beautifully woven and that Shafak develops her characters and setting in a marvelous way, but I was sometimes left with a feeling of discomfort that I didn’t really understand the driving force of the story. I cannot point to a climax or a point of rising action. The story was centered on one horrific act of murder but at the same time, that seemed to be a side issue. The thread of feminism peeked in periodically, but it never took center stage. There were relationships that began to deepen and change, and then all of a sudden they were terminated or left hanging. I do not know if I am ready to state this as a criticism, or to explore it as a different style of writing. I chose this book for the purpose of learning more about Turkish culture and philosophy, and it is very probably that this method of story-telling is giving me the very information I was looking for. Whereas in American literature there must be a problem and a hero and a climax and then a resolution, perhaps that is not the proper mindset with which to approach this book. I do not like to give away the story lines of the books I read, otherwise there is no point in recommending them! But, I will tell you that this story follows both the past and present of a Turkish immigrant family in London in the 1970s. The family faces deep struggles of love, belonging, contentment, shame, and honour. These themes are going to change and alter the family, but in the end, they are going to find themselves in very similar if not the same positions as their predecessors. What does that mean for their system, their way of life, their belief system? Does it leave them with satisfaction and meaning? I myself don’t know. It will take some mulling to come to some conclusions. But, isn’t that the mark of a good book? It continues to make you read it even after you have closed the last page. I do apologize that the book is not the easiest to find, but if you have an electronic reader, you can purchase it from the Amazon UK store. Otherwise, you may have to hunt for a bit to find it!! Rock cliffs rising up. Bright sun shining down. Incredible green encasing us. A fantasy world. A world where the only traveling companions are lazy old cows, elderly flies, and scared frogs. Where the dirt paths wind up and down, and up and down. Where the midday call to prayer rings out loud and clear across the valley between the mountain peaks. Where a wrong turn leads you to a comical collection of old people hanging out their windows and relaxing on the deck, no doubt drinking tea and talking about the good old days. Old people with lisps and exaggerated speech, with excitement in their eyes that someone so foreign could get lost on their road. A world with no noises to interrupt the thoughts, and the midday sweat of hard work running down your face. Are you imagining yet? Keep walking, it’s a long hike, but it’s so close, and way more than worth it! The ground finally levels out, but is still just crawling with green vegetation. Follow the sound of the water, there it is. The old bridge. The bridge that was made of trees that must have lived before Turkey itself was a country! It’s obvious by the swaying and mangled way the boards lie that others have used this multiple times, but that thought does not entirely put you at ease as you look down at the happily churning blue-green water below and feel the wind carry you left and right in a tremulous rhythm above the rocks. Step by step, don’t hold onto the rails too tightly, because a heavy bird might be the end of them, much less your adrenaline filled, tired, and sweaty hands. Cross carefully! It’d be a shame to end here, you haven’t yet met the frogs or touched the cool swirling water. Once you’ve made it, approach the water. Sink your toes into the muck as it gobbles up your feet and argues with you about giving them back. Watch the frogs dive in to sound the alarm that invaders have arrived. The pool is no longer in solitude! The water is cold, breath-taking, but refreshing after the long walk, and the hot sun. Get in, feel the rush of the current pulling you. Be careful not to twist your ankle in the bigger rocks. Look around. See the mountains towering high all around you, the beauty of the color of the water rushing past you, the lush green filling up all of the space that is not rock, water, or sky. Notice that there is not the sight, nor sound, of another human anywhere. This pool is yours for these few short hours, and you do not have to share with anyone. Rejoice in the beauty of the Creator, and joy of love together. Relish the adventure of life. This was Monday afternoon in our Black Sea trip this last week. What an amazing memory . . . I am so thankful! Let me know a favorite getaway or a favorite anniversary memory in the comments below! Hope you enjoyed a little snippet of our time away!